Renaming a class that is used widely throughout a project could take a lot of time but the Eclipse refactoring wizard makes the job easier by automatically detecting all dependencies on the class being renamed and modifying them also. Right clicking on a Java element in the Package Explorer view and selecting Refactor menu item. Right clicking on a Java element in the Java editor and selecting Refactor menu item. 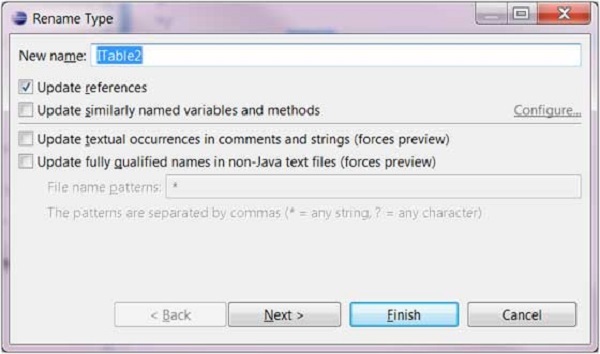 Selecting a Java element in either the Package Explorer view or Java Editor and clicking Shift + Alt + T.
The refactor menu shows all the possible changes that are supported on the selected Java element. To rename a class, select the Rename menu item. Click on the Next button to see a preview of the changes (if available). Then click on Finish to get the wizard to do its work.